"Traction and rolling stock" is an important point which will affect how people view the line and what sort of timetable can be offered. Therefore it warrants a page of its own. Overhead live wires electric (usually AC). Of these, the two quietest ones are the electric options. AC offers better acceleration (and therefore a shorter journey) but involves visually intrusive overhead wires. The third rail is normally only noticed just after someone trips over it and shorts themselves out. (For various reasons, while contact with either is usually fatal, the 750V DC in the third rail is slightly more likely to be fatal than the 25kV AC in the overhead live wires.) Third rail is also widely regarded as obsolete and is generally discouraged; 25kV AC electricity drawn from overhead wires is the official UK standard which will be used for South Wales electrification and any attempt to bring electric trains to the Severn Tunnel Junction to Gloucester line. Accordingly there will be a round of attempting to persuade everyone that the catenary is either largely invisible or really quite decorative (round supports coated in green paint are likely; where possible they will be hidden behind trees and in stations they will be disguised as lampposts) and if the line is to be electrified that is the system that will be used. This would also make the WVR the only line to have been worked by the basic 4 trains each way each day service to also be electrified. So why not use one of the other options? They're all much cheaper to set up. Cheaper to set up they may be, but they are also noisier and more expensive to run. Steam locomotives are even more obsolete than third rail; a steam loco needs its own shed (where it can be dirty in peace) and has to be crewed by two people who are required to spend a few hours every morning getting it out of bed. Labour and land aren't cheap enough for such luxuries. A peak summer steam service run by volunteers is a possibility, but year-round operation with steam locomotives on a commercial line (which this plan to re-open the WVR would like to fancy itself as) is out of the question. Diesel isn't as noisy or dirty as steam and isn't as fast, clean or quiet as a leccy. A diesel doesn't detract visibly from the landscape, but does put out more pollution and its little internal combustion engine is audible from a distance. However, should the line have financial issues it will almost certainly end up with cast-off diesel units. Gas turbine hasn't been tried much in this country. It was used by four bits of kit, known as 18000, 18100, GT3 and APT-E; it appears to have been regarded as an expensive and awkward failure. 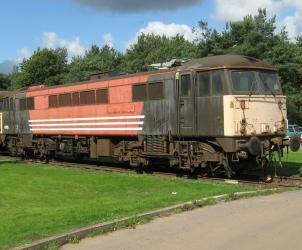 APT-E rounded off the use of the technology in 1976; there has been no experience of it in trains built for the UK loading gauge since. Electric trains also have the benefit that putting all the power equipment under the passenger compartment doesn't reduce the comfort for passengers. With the WVR's short platforms, it is preferable not to end up having dead space at the ends of the regular trains for power units, boilers and such like. Accordingly electric trains, powered from overhead live wires, will be the main fleet. Although the mainline between Severn Tunnel Junction and Wye Valley Junction is not due to be electrified, the benefit of arranging the "Metro" service suggested on the previous page is that it justifies someone else wiring up the mainline. The costs of wiring 15 miles of the WVR would be reduced by doing it during re-opening and recouped by savings in diesel fuel (which is only going to get more expensive). Electric trains also tend to be cheaper to maintain and more reliable than diesels, but this is balanced by them costing more to buy. Second-hand ones would be nice but there aren't many second-hand medium-distance electric trains knocking about at the moment. Asked to write a spec for the line, the request would be for a fleet of trains with 5 short, fat, articulated vehicles with one wide doorway on each side of each vehicle. (Alternatively the bodyshells of London Overground's new Class 378s would be fine, although a different interior would be specified and 3-car rather than 4-car sets would be the limit that would fit comfortably into the platforms.) Full-width corridor connections between the vehicles would be provided. One toilet would be provided per train, along with enough luggage accomodation for 10 bikes or canoes. Efforts would be made to get a glass back on the cab so passengers can see the line ahead. The trains would be purchased by one of the Rolling Stock Leasing Companies and leased to whoever operates the railway. The general aim would be to either get something completely tailored to the line (which would then remain here for the entire working life of the fleet - 40 years or so) or a more generic design tacked onto the end of whatever new train is being built at the time (something which the West Yorkshire Passenger Transport Executive did in the 1980s - BR had just bought 35 2-car Class 155 diesel trains so West Yorkshire ordered 7 such sets for themselves). It cuts costs somewhat and opens up the potential to offload the Wye Valley batch onto whichever operator ordered the rest of the fleet at the mid-life overhaul, with the WVR getting some lovely new trains from an order tacked onto the end of whatever new train is being built at the time (something which the West Yorkshire Passenger Transport Executive hasn't tried - not helped by a massive increase in the costs of buying trains and the fact that the other 35 2-car 155s have mysteriously morphed into 70 1-car Class 153s). The two tunnels provide a bit of a problem for electrification, since they aren't exactly big to begin with before wires get hung from the roof. The floors may need lowering (normal for electrification schemes). Bats, like birds, will be able to hang from the live wires without issue so long as they don't touch anything else. Unlike the birds, they would be swiftly knocked off by the pantographs of passing trains. However, since the tunnel bores are also home to a freezing cold Monmouth-bound breeze, it is unlikely that any self-respecting bat would care to hang from the live wires and get a chilly head. These can come in two forms - heritage electric trains (of which there are plenty) and heritage steam trains (of which there are also plenty, but other people want them because they're popular). The peak-summer specials would operate between Tidenham and Tintern. They would basically aim to provide an attraction to get people out of their cars at the busiest time of the year by making the service more intensive with something a bit unusual. If a couple of steam locomotives and some Mk.1 coaches can be procured then this something would be a steam locomotive operating a regular service train in the Wye Valley. This would get more people out of their cars, but would be expensive to run and the smoke and noise might upset the neighbours. The other option is running heritage electric trains. These come in third rail and overhead wire varieties, although there are more of the third rail type because third rail has been around for longer. Either way, they can normally be found looking lost and a bit vandalised because they don't work well with steam locomotives and need a power supply to move themselves around. Accordingly, bringing them to the Wye Valley for a few months in the summer would give them something to do, bring in the electric train enthusiasts (there are some) and justify asking the Heritage Lottery Fund to cover half the cost of wiring the Tidenham to Tintern bit (and yes, it is entirely a coincidence that the popular bit that would justify extra trains is also the bit with two tunnels and a river crossing that will be an absolute pig to wire). They wouldn't be as popular as the steam trains, but would offer something a bit different and wouldn't pollute the bats. Special trains from further afield to Monmouth would be less likely due to the lack of line capacity north of Tintern, making it very tricky to get large locos and long rakes of coaches up the line. Accordingly, don't expect to see Flying Scotsman at Monmouth Troy in a hurry. None are planned at present. There is no goods traffic available which meets the normal rail requirement for trainload freights (large quantities on a regular basis) and so there is no immediate risk of big heavy goods trains thundering down from Monmouth. Tintern Quarry is unlikely to re-open; while we'd like the cheap ballast and daily heavy goods train, this has to be balanced against the local environment - which would prefer to let the place return to nature. The railway runs through various bits of Forestry Commission woodland, so timber traffic is a possibility; railheads north of Whitebrook and Tintern Quarry would be provided. Timber traffic is not consistent; services would operate as and when required. It should be emphasised that in this event the goods train would be taking several lorries off the road, thereby benefitting the overall environment. Goods trains also make more money than passenger trains and so would be able to subsidise passenger fares. It is recognised as unfortunate that, since big lorries are currently unable to travel down the Wye Valley, local residents would not be in a position to fully appreciate these benefits and would instead just see Class 87s humming across Redbrook level crossing, past Llandogo and through Tintern station with 20 large wagons in tow, which is not wholly in keeping with the idyllic country scene. Even when limited to 35mph. 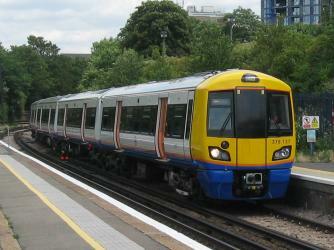 A Class 378 ambles into East Croydon. The WVR would use a blue and green livery. 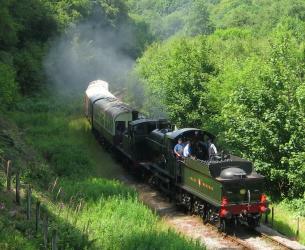 A short steam train on the Dean Forest Railway, headed by City of Truro. A rather faded Class 87 in store. There are a few left that could be hired in.